British Airways has welcomed the arrival of its first 787-9 Dreamliner. This time-lapse video takes you behind the scenes at Boeing’s factory where the aircraft, and its millions of parts, is painstakingly and, using both astounding automation, as well as manual labor, amazingly constructed. The 787-9 is 20ft longer than its 787-8 predecessor, making room for a new painstakingly designed eight seat First Class cabin. Click on the photo at the top of page – – – and enjoy the ballet! As always, remember to keep your speakers turned on so you can appreciate the scoring. This video is only 4 minutes long. Because of the modern “composite” structure, this graceful looking new airliner is basically made offsite – – – and later joined together in Boeing’s Everett, WA facility. If you have not seen how they paint it, you will enjoy this video. The much earlier Boeing 747 and 777 models are painted the same way, using rolls of tape and brown paper, so not all the manufacturing technology is new. For more details on this advanced airliner, just click here. 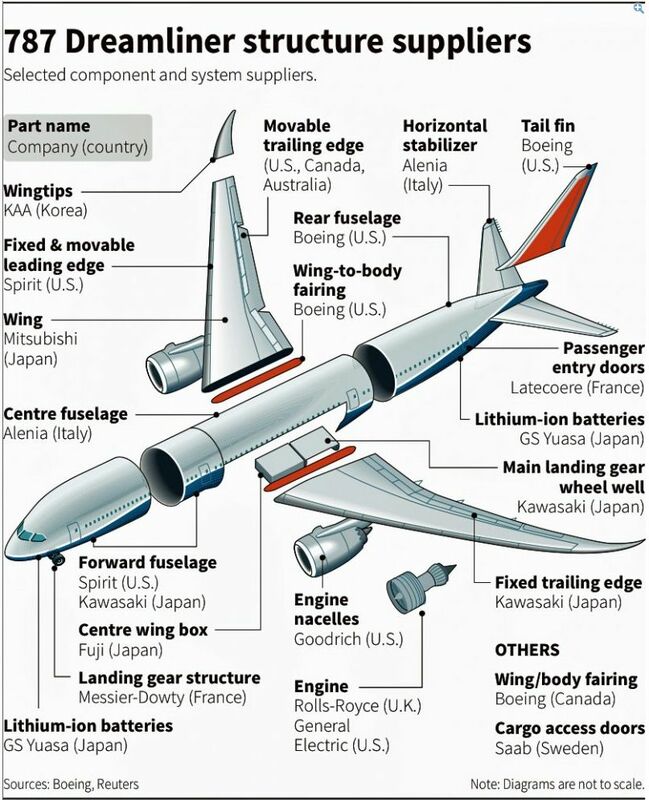 To understand from where all the components hail, just look at the below Reuters’ 787 drawing. This diagram shows how the Dreamliner’s parts literally come from every corner of the globe. It really BOEING DREAM LINER article makes one wish we could turn back the “pilot aging process” & have the opportunity to again-work with the NEW BOEING’s. In over 39 years of airline flying, being in a BOEING was always a confident/secure & great feeling! When over the N. Pacific (SE ASIA/USA in a 707-320C & later S. Pacific between HNL/Pogo Pogo, LAX/HNL route in a B-747, the Micronesia Pacific Islands between HNL & Guam, Guam to Japan, Yap, Palau in a B-727-100 & Domestic B-727-200 USA, Mexico & Canada, it was always over the years, great flying!.. (rain or shine –day or night). In the latter part of my career, the MD-DC-10 & DC-10-30 were 10,000 hrs.+ history in my logbook. It could be summed-up by words from a Senior Capt. mentor of mine, “send it back to Boeing for modification & it would be fine.”— & with the 2-company merger later on, in a sense this was done! Excuse me if I got over-whelmed with BOEING, but that is the way it is…. !